Directed by Sophie Fiennes (sister of Ralph and Joseph Fiennes) who made THE PERVERT’S GUIDE TO IDEOLOGY, this doc on Grace Jones is not the typical biographical doc. The doc shares Fiennes’ sense of humour, evident in the aforesaid mentioned film about ideology seen from the point of view of Slovene philosopher and psychoanalyst Slavoj Žižek. 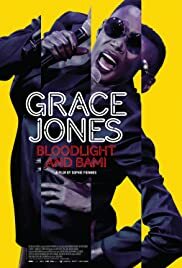 In the case of GRACE JONES: BLOODLIGHT AND BAMI, the doc follows the model, actress and drama queen as she travels to world, particularly to her home country of Jamaica where the audience sees her at home with family. In short, the doc plays like a Grace Jones reality show. Many first heard of Grace Jones in the role of bad woman MAY DAY in the James Bond flick A VIEW TO A KILL with 007 Bond Roger Moore. Of all the Bond secondary villains, only two have survived the test of time – Jaws and May Day. From then on, Jones has become larger than life, wild, scary and androgynous. She is now a pop culture icon at the ripe age of almost 70, but still blessed with the good looks of a woman under 40. Director Fiennes reveals Jones also as a lover, daughter, mother, sister, and even grandmother. 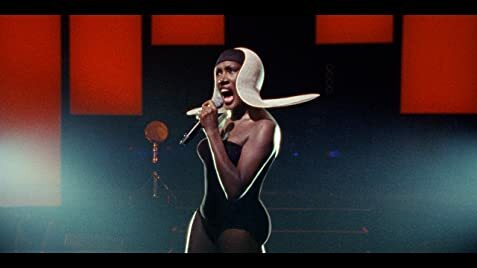 Filmed over the course of a decade, Grace Jones has become an electrifying journey through the performance, private and public worlds of the Jamaican-born singer. Fiennes intersperses the doc with various spritely musical numbers that lifts her film to ecstatic nights as Grace know how to captivate her audience. Her performances are colourful from the lighting of the shows to her elaborate costumes that include the most outrageous hats. Jones is also shown as a tough cookie. She only performs when paid in advance. Once she refuses to perform around surrounding females (in Paris) as she claims she looks like a Madame in a female brothel. She wants the female dancers replaced by males. Jones can also speak English with a French accent (she does speak French too) and also with a British and Jamaican accent. The prize segment of the doc is Grace chatting with her grandmother. Her grandmother is beyond shy, with her breasts (despite her age) being the best in show. Her words to Grace are all hilarious. The film premiered last year at the Toronto International Film Festival with Grace present as one knows this woman just loves the spotlight.